I was privileged to be invited as an international participant in the National Encounter for Peace Education, along with almost a thousand Colombians, as the country prepares for the peace agreement to be signed between the government and the FARC guerilla movement. 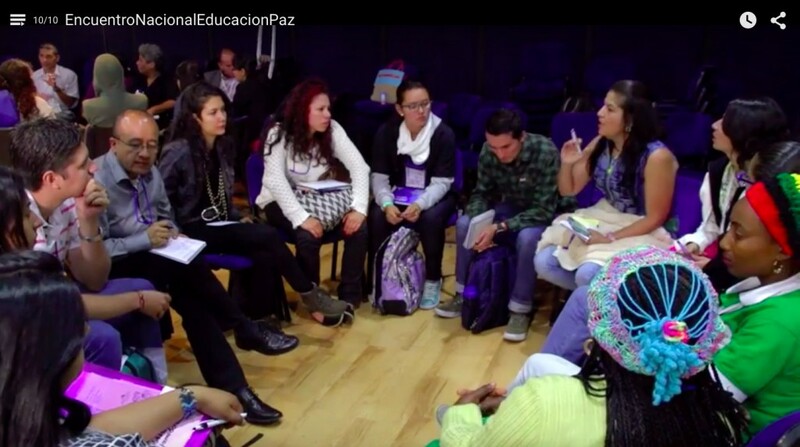 The Encounter took place in Bogota and was sponsored by a wide range of civil society, governmental and international organizations, including the national and local ministries of education as well as UNICEF and the the UN Development Program. It was very well directed by Amada Benavides and her organization the Fundacion Escuelas de Paz. The Encounter was full of the energy and hope of the Colombia people, because after more than forty years of civil war, they can begin to make a culture of peace in their country. I was very impressed by the youthfulness of the Encounter. A majority of the participants were young people, and in some of the roundtables the questions were posed by the youth representatives as we sat in circles and everyone participated. It was also impressive that the participants understood very well the distinction between peace and culture of peace as defined by the United Nations, and they want to work for the culture of peace that includes not only disarmament and education for peace, but also humans rights, equality of women and men, democratic participation, tolerance and solidarity, free flow of information and sustainable development. Perhaps this should not be surprising since during the International Year for the Culture of Peace in 2000, the Manifesto 2000 was signed by 40% of the population of the country. Everyone recognized that the future of the peace process will depend on education, both formal and informal. In this regard, there were lively discussions between representatives from the ministry of education and from the civil society, with demands that the needs of women, youth and handicapped should be given priority, and that education should be reformed with participation of the people rather than determined by government bureaucrats. “How can education promote a culture of peace” was at the top of the agenda, and as a result of the Encounter, an Agenda for Education for a Culture of Peace is being prepared and will be submitted to the country’s education authorities. There was an important contribution from the many universities in Colombia, and it was announced that the education for peace process will be aided by a network of universities for peace. The international representatives invited to the Encounter were given a place of honor, as it was expected that the process of Colombia should learn from and contribute to peace processes around in the world. In addition to us, invitees included Alicia Cabezudo, Vice-President of the International Peace Bureau, Marina Caireta from the School for a Culture of Peace in Barcelona, Janet Gerson from the International Institute for Peace Education in the United States and Mario Lopez and Carlos Martinez from the University Minuto de Dios in Colombia.